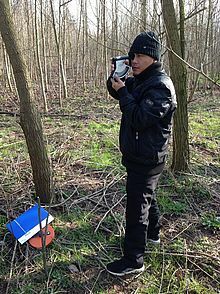 The German Forest Society is the responsible organization of “The Forest Expert Program“ which aims at increasing the professional exchanges of forest management, related experiences among forest experts, and thus building capacity and transferring knowledge in the field of sustainable forest management to other trainees from different countries and regions. The program is funded by the German Federal Ministry of Food and Agriculture (BMEL). For 2018, the Forest Expert Program organized one full month training program, which consists of a three weeks Carbon Forestry Course, and another week with visits to forestry offices and field practices. The course has been organized by the Faculty of Environment and Natural Resources, at the University of Freiburg. In total there were 29 trainees, of which eleven are international master students from the University of Freiburg, and the remaining 18 from different countries and continents. I was the only trainee from Lao PDR. I am working for a GIZ project called ‘Climate Protection through Avoided Deforestation’ funded by German Federal Ministry of Economic Development and Cooperation (BMZ). The CliPAD project supports the national REDD+ program which including institutional arrangement, capacity building, the Emission Reductions Program Document (ER-PD), National REDD+ Strategy Development, Provincial REDD+ Action Plans (PRAPs), Development of a Safeguards Information System (SIS) and a Benefit Sharing Mechanism (BSM). At local level, the project is also working on Village Forest Management and livelihood improvement activities, among others. The Carbon Forestry Course has opened opportunities to me to deepen my technical knowledge on international Climate Change policies to address the impacts, some mitigation activities/measures taken that are related AFOLU sector such as CDM (A/R), REDD+, Improved Forest Management (IFM), Forest Landscape Restoration (FLR) and others. Successfully, after the completion of this course, the trainees have been able to assess different land use based projects including a VCS based Chyulu Hills REDD+ project located in Kenia as a case study. In addition, after the Carbon Forestry Course, my colleague from the Regional Environment and Forestry Education and Training Center in Samarinda, Indonesia and me, had the opportunity to visit different forestry offices and visited some field areas. The field trips allowed us to better understand how sustainable forest and biodiversity management in Baden Wurttemberg functions. We had the chance to learn about forest planning and monitoring, forest restoration, forest inventory, logging process, forestry information system, biodiversity protection, ecotourism and recreation to draw lessons learnt and inspirations to transfer these to the conditions in our home countries. The visits to the Forest Education Center in Karlsruhe and House of Forests in Stuttgart were important for me to learn about and appreciate the technical capacity building to the government and private forest professionals. We got insights on how knowledge transfer could be arranged in cases of special training courses for community forest workers as well as providing excellent forestry and environmental awareness raising to all people with special focus on kindergarten pupils. All these are relevant lessons for the project I am working for as well as for any future forestry related projects in Lao PDR since capacity building is one of our main aims as technical advisors.